Luckiest Productions and Neil Gooding Productions present Show Stoppers, a magical night packed with songs from the world's most memorable musicals. Old and new; funny and sad; from Broadway to the West End and beyond – all of your favourite show tunes are brought to thrilling life by some of the most acclaimed stars of Australian and international music theatre. Show Stoppers is available for club and corporate bookings. To book Show Stoppers, please contact Jeremy Sharp or Tony Grace at the Harbour Agency: 02 9331 5888. Show Stoppers premiered at the Riverside Theatres in May 2010, and has appeared at numerous theatres and clubs since that time. 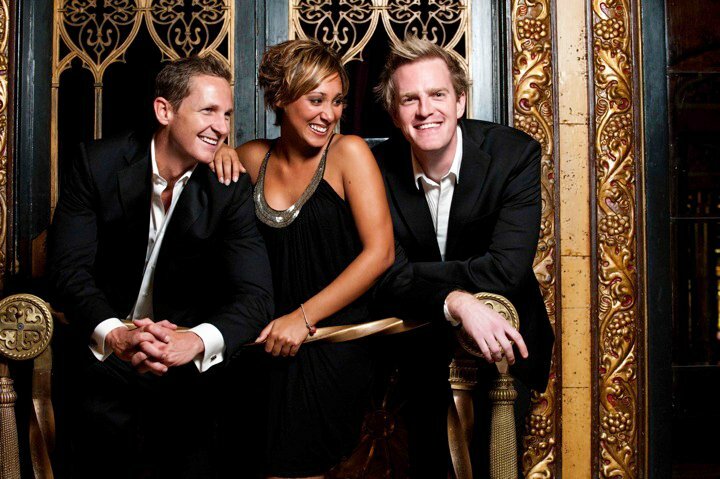 Three terrific musical theatre talents sing the best-known showtunes from some of the most popular musicals in recent memory, rousingly accompanied by a piano, percussion and bass trio. That’s the formula for Show Stoppers, a show developed for club and regional performance, playing several of dates at Parramatta Riverside Theatres prior to hitting the road. 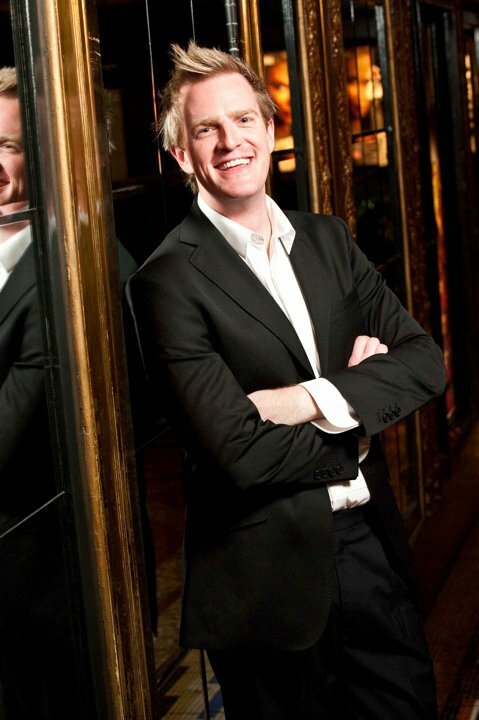 It’s a repertoire of safe commercial choices, fabulously sung, and aimed directly at pleasing its target audience. Opening with a showbiz sequence, a mix of medleys, duets and solos make for an enjoyable evening of familiar musical theatre songs, strung together with light banter, light-hearted point-scoring duels and the odd touch of musical theatre background. It’s an almost Sondheim-free zone, with lots of Lloyd Webber. This is the Moment from Jekyll and Hyde and Lily’s Eyes from The Secret Garden are the only selections even vaguely out of left field. Hits including Les Miz, Phantom, West Side Story and Chicago, a healthy serve of Rodgers and Hammerstein, or medleys based on love and rain songs dominate proceedings. Immensely talented West End visitor Sophia Ravagelas is partnered with two splendid local musical theatre men, David Harris and James Millar. Sophia who hails from London’s West End, where her credits include four years in two different leading roles in Les Miz, gave a stunning performance of I Dreamed a Dream from that personal hit. A versatile performer, she ranged from big ballads and belt to the tenderness of Maria in West Side Story. Memory from Cats, not a huge favorite of mine, was fabulous in Sophie’s hands. David and James combine splendidly in Lily’s Eyes, link up with Sophie in various medleys, duets and show excerpts, and solo impressively on Bring Him Home (David) and This is the Moment (James). When the men express their envy of all the great roles written for women, I was disappointed that what ensued ended up as mostly gimmicky comedy, with numbers like I Enjoy Being a Girl, Big Spender, I Can’t Say No and Mamma Mia. The show’s sole Sondheim rep, Broadway Baby, was the highlight of the sequence, but where were the great songs and roles they coveted? One of the great eleven o’clock numbers, sung seriously by a guy, would have helped nail an idea which all ends up a bit campy. I Honestly Love You (David) was the Australian representation, with I Still Call Australia Home providing a rousing encore. 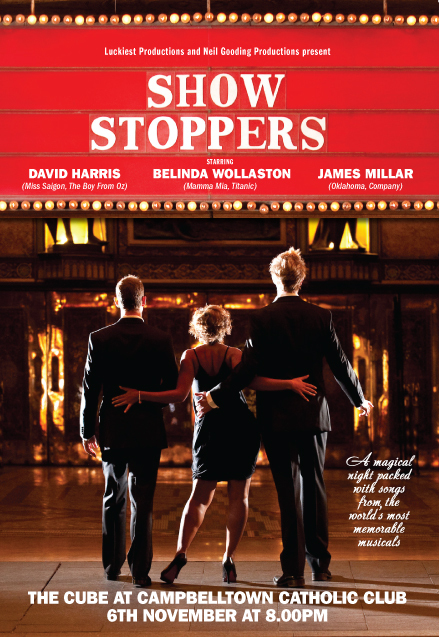 Show Stoppers is a highly entertaining, very accessible afternoon of musical theatre favourites.